Five active children with special needs promote positive awareness and role models during play. 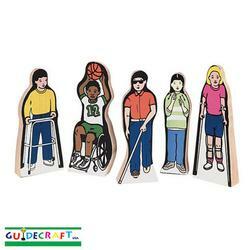 Wedgie™ figures stand 4 1/2" tall. Method of shipping is UPS Standard. Material: Wood, silk-screened.